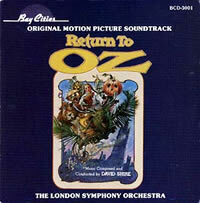 This is the original soundtrack to the 1985 WIZARD OF OZ sequel, RETURN TO OZ starring Fairuza Balk, Nicol Williamson and Jean Marsh. It has been six months since Dorothy has returned to Kansas from Oz and she still cannot sleep. She has been going on about imaginary places and people so much that Aunt Em takes her to see a doctor. Dorothy promptly escapes from the mental hospital and wakes up in Oz where her favorite chicken can now talk. There she meets a whole new bunch of friends and they set off to rescue the Scarecrow from an evil Gnome King who has found her Ruby Slippers and has used them to lay waste to the Emerald city and take over Oz. David shire delivers an unforgettable score.